Last spring, a student I was tutoring told me his back hurt. The boy, a 14-year-old in Washington, D.C., had played on school and travel soccer teams in the fall. Despite his pain, he was still playing travel ball, competing in weekend tournaments and practicing twice a week. I watched him struggle to squeeze in schoolwork around these commitments. At some points, he was reduced to lying on the floor with his feet up against the wall as we worked to prepare him for quizzes. After a few weeks of this, he saw a doctor who diagnosed a spinal stress fracture. In an email to me, his mother faulted all the soccer he had played — even after his back began to hurt. This story is hardly unique. 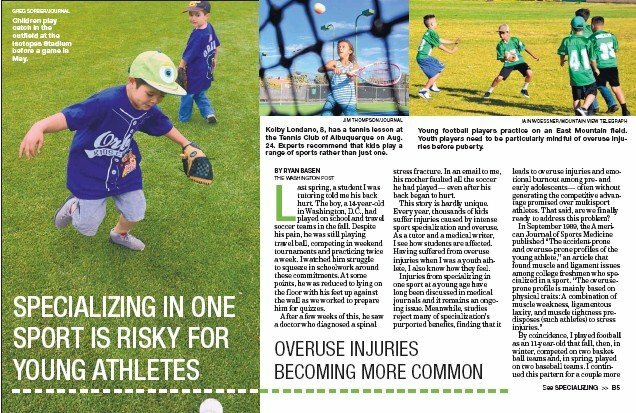 Every year, thousands of kids suffer injuries caused by intense sport specialization and overuse. As a tutor and a medical writer, I see how students are affected. Having suffered from overuse injuries when I was a youth athlete, I also know how they feel. Injuries from specializing in one sport at a young age have long been discussed in medical journals and it remains an ongoing issue. Meanwhile, studies reject many of specialization’s purported benefits, finding that it leads to overuse injuries and emotional burnout among pre and early adolescents — often without generating the competitive advantage promised over multisport athletes. That said, are we finally ready to address this problem? In September 1989, the American Journal of Sports Medicine published “The accident prone and overuse-prone profiles of the young athlete,” an article that found muscle and ligament issues among college freshmen who specialized in a sport. “The overuse-prone profile is mainly based on physical traits: A combination of muscle weakness, ligamentous laxity, and muscle tightness predisposes (such athletes) to stress injuries.” By coincidence, I played football as an 11-year-old that fall, then, in winter, competed on two basketball teams and, in spring, played on two baseball teams. I continued this pattern for a couple more years. During the spring of my freshman year of high school, though, my right knee began to ache. I told nobody about it, practicing or playing nearly every day even as a sharp bone began to protrude out of the joint, masked only by a stretched layer of skin. After meekly running out a ground ball during one game, I limped back to the dugout. My coach pulled me aside. My doctor — also my father — jogged down from the stands and demanded that I show him my leg. I was later diagnosed with Osgood-Schlatter disease, a painful condition that occurs during adolescent growth spurts, and more often in people who participate in running and jumping sports that put stress on bones and muscles (and caused the bone to protrude from my knee). I was lucky. I missed only two weeks of action and was able to play the rest of the season wearing a felt brace on the knee. I clearly overdid it with too much running and jumping sports, then failed to say that I was hurting. I was a hyperactive, stubborn kid who loved sports. Today, the issue is often that parents, kids and coaches feel the pressure to pick one sport to specialize in as the best way to become an elite athlete. It’s not just because of the premium on being “best” in something; there’s also a financial incentive to make a child stand out for a college scholarship, or, however unlikely, a future in professional sports. In fact, sports researchers have recently found that specialization leads to overuse injuries, with risk increasing in proportion to the degree of specialization. It also stifles motor-skill development in pre-adolescents, increasing injury risk. A study published in February found that high school athletes who played one sport for more than eight months in a year were nearly three times as likely as others to suffer overuse knee injuries, for example. Playing only one sport and doing it year-round are the chief catalysts for the dozens of overuse injuries that pediatrician Brent Thibodeaux, who practices in Northern Virginia, examines every week. Kids who don’t slow down when injured can suffer debilitating effects from overuse injuries that last into adulthood, according to new research, including burnout and, counterintuitively, “lost development of lifetime sports skills.” If kids and parents don’t pay attention to their doctors’ advice, they should at least spend some time with the latest research on how to best nurture athletic success. It turns out that the much-ballyhooed 10,000 hours rule for mastery of an activity may not be the best way to become an elite athlete. Instead, researchers suggest that engaging in unstructured activities and sampling multiple sports before adolescence best predict long-term athletic success (and psychological maturity, to boot).